The story of the young hero who defeated Goliath and became King of Israel was particularly popular in the early Renaissance. 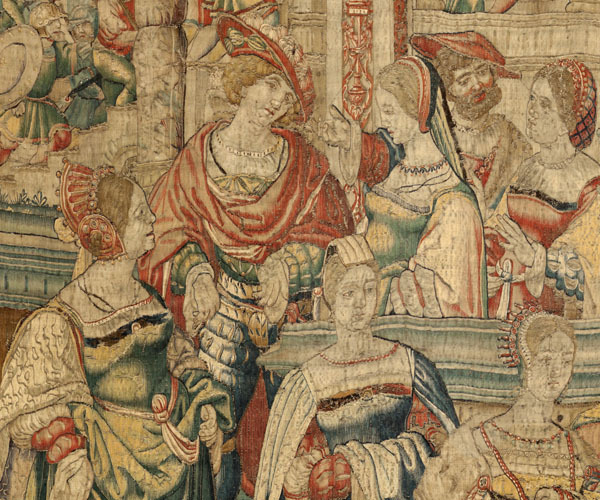 More than twenty such tapestry series woven between 1480 and 1530 are preserved, not all of them complete. One of them belongs to the Cathedral of Burgos, where it arrived in 1535 as a bequest from the bishop, Cardinal Íñigo López de Mendoza, whose escutcheons are reproduced on the upper part of the border. 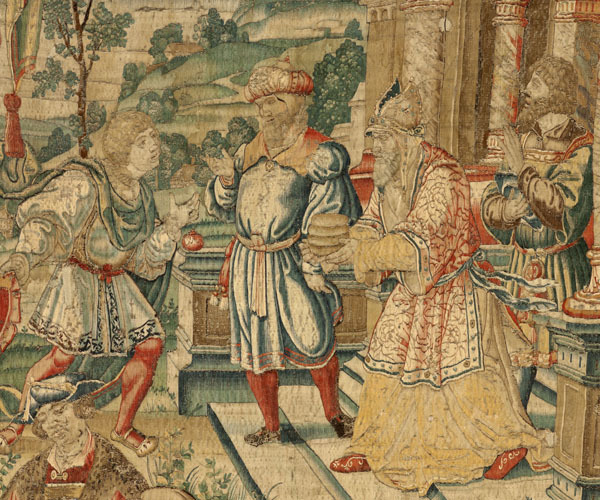 The will of the Bishop of Burgos included a bequest in which he ordered the delivery of seven tapestries to the Cathedral of Burgos: "I send to said treasurer [of the cathedral] the seven tapestry cloths on the story of King David which were bought in Flanders". It is likely that the bishop bought them in Brussels, since he moved to England as an ambassador of Charles V in 1526. He must have made the deal during that journey, which followed a route through Brussels at the time, or on his way back two years later. 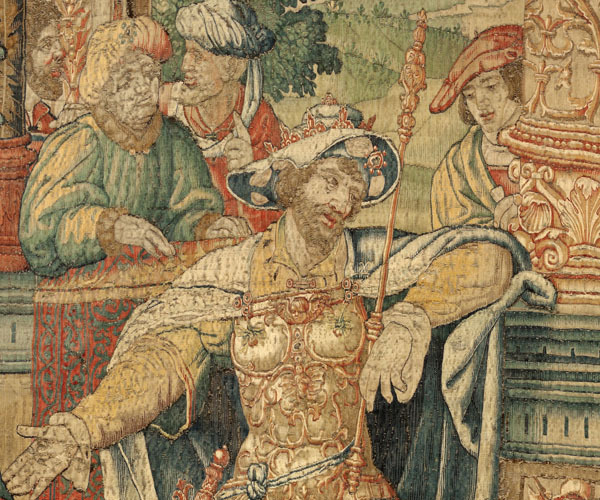 They must have been already woven, because his coat of arms is sewn on top of the tapestry. 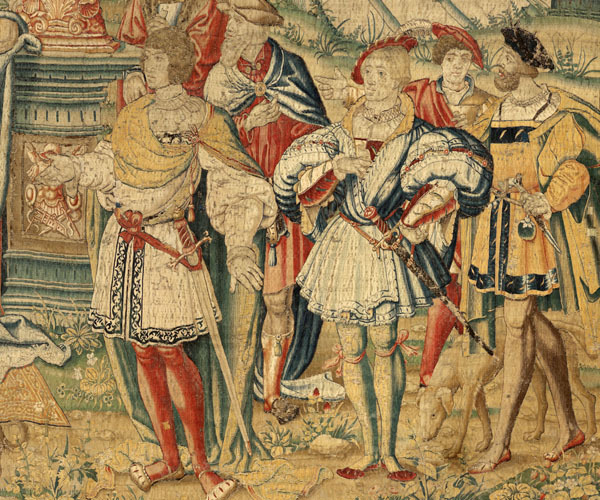 An inventory dated to 1546 confirms the existence of the tapestries in the Cathedral: "seven rich tapestries on the story of David, given by Cardinal Don Íñigo López de Mendoza". They were woven in Brussels, as indicated by the mark B▼B placed on the left selvage, following a design close to that of Bernard van Orley. The introduction of gallant scenes in an architectural space of classical but heavily decorated forms suggests the aesthetics that became dominant in the third decade of the 16th century.